-12AN o-ring style outlet fittings available for -10AN, -12AN, -16AN, 5/8'', 3/4'', 1'', or 1-1/4'' slip hose. Finishing The System: This pump is supplied complete with hardware but without the inlet and outlet fittings. The fittings need to be ordered according to the type and size of the desired hose connections. Overall Height Dimension: The standard pump is 5.50'' long from the mounting surface to the tip of the pump. Pump Weight: This application weighs 6.3 lbs. Built to Flow 35, 42, or 55 GPM! Remote pumps are the solution when an engine-mounted pump is not available or space limits the ability to use one. 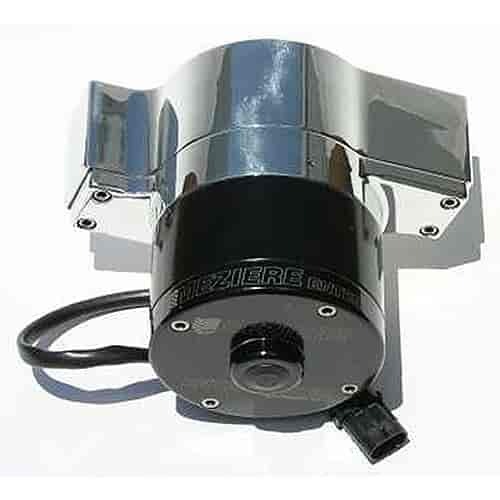 These bulkhead-style pumps mount to the frame, firewall, or back of a motor plate. All plumbing inlets/outlets are on one side to install easily and to eliminate any need for a water manifold or distribution block. Standard 100 Series Pumps flow 35 gpm while heavy-duty 100 Series Pumps flow 42 gpm. The 300 Series offers a high-flow water pump at 55 gpm. The pump housing, motor cap, and impeller are CNC-machined from 6061-T6 billet aluminum, and a stainless steel impeller shaft runs through a carbon-ceramic seal to isolate the epoxy-coated motor from coolant. The motor also has a radio frequency suppression circuit to reduce ignition (RF) interference.